There is nothing worse than having an itchy bug bite that manifests with a blister and not knowing what bit you. Being able to identify the characteristics of a blistering bite can help you learn the necessary steps to treat it, as well as figure out if medical attention might be needed. 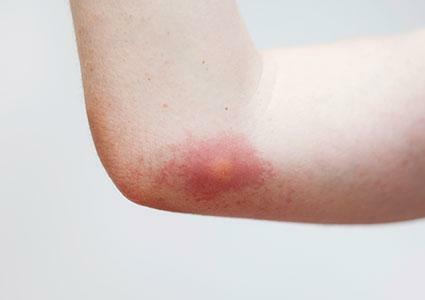 Most people will feel mosquito bites soon after the bite has occurred. The affected area will welt and become red, and a small hole will appear in the center of the bite. Mosquitos are known to carry the West Nile virus and malaria. They typically appear in areas where this moisture like lakes, pools, or empty flower pots that are full of water after a fresh rain. Many people who live in the southern states will often suffer from ant bites, especially fire ants. Many people have made the mistake of stepping into a dirt mound or climbing a tree infested with ants only to be bitten multiple times. 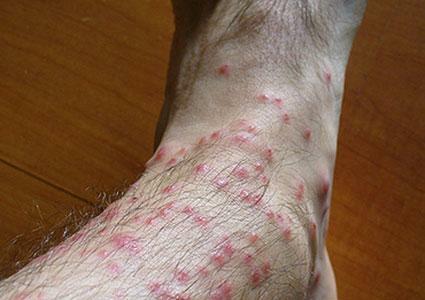 After an ant has bitten into the skin, it will welt and become very red and itchy. A small amount of pus may be present in the lesion. In order to avoid infection, try not to break the skin if you feel that you must scratch. When a person is stung by a bee, he or she will immediately feel pain. 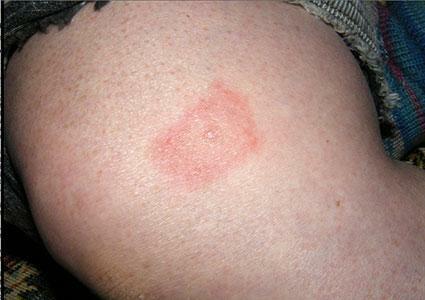 Shortly after the sting, the affected area will swell and become red. There will be a white spot at the site of the puncture. In most cases, the pain will subside fairly quickly. Over-the-counter pain medications, antihistamines, and antiseptic ointments can be used to treat the sting. Unlike bees, wasps have the ability to sting their prey repeatedly since they do not die after injecting venom. Medscape classifies both the yellow jacket and the hornet as social wasps, which are aggressive. As with a bee sting, pain quickly follows after a person has been stung by a wasp. Swelling and redness will occur at the site of injection, along with a dull ache. Apply ice to the wasp sting to help with the swelling and apply a topical antihistamine to help with itching. Ticks are often found on animals and in greenery, but they can also feed on humans. Ticks are known to carry diseases such as Lyme disease and Rocky Mountain spotted fever. 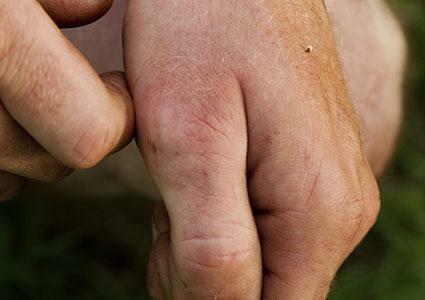 There is no immediate pain after being bitten from a tick, but redness and blistering occur at the sight of the bite. Additional signs of being bitten by a tick may include flu-like symptoms and muscle stiffness. A person should visit a doctor when they notice, or suspect they have been bitten by a tick, to make sure no diseases have been passed to them. A chigger is a type of mite which is very small in size. 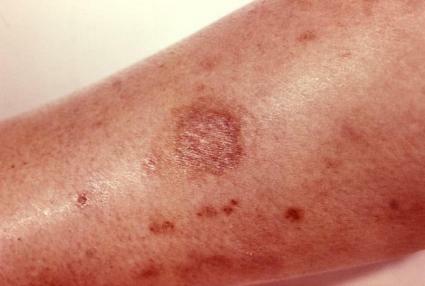 When a person is bitten by one, a tiny red bump is left behind on the skin. 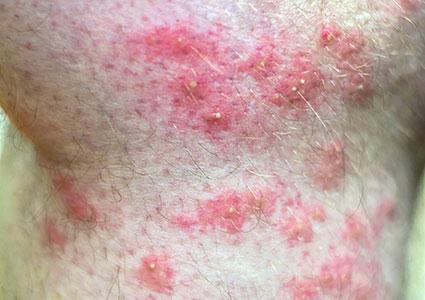 The skin will become very itchy within three to six hours after the bite takes place, and the sensation of itching will peak within 24 to 48 hours. Using calamine lotion on the bites can help with itching, but often times scratching repeatedly leads to infection, so an antibiotic prescribed by a doctor will be needed to treat the problem. Black widow spiders have a distinct red marking on the body and, according National Geographic, "are considered the most venomous spiders in North America." 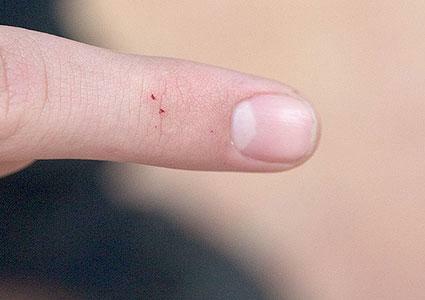 A person may not know that he or she has been bitten right away, but localized pain at the site of the bite will occur about 15 to 20 minutes later and there will be two small red bites left on the skin. Other symptoms include muscle aches, muscle weakness, nausea, headache, increased salivation and sweating. Note: Seek immediate medical attention if you believe you have been bitten by the black widow spider, as skin damage is sure to follow along with other respiratory problems. The brown recluse spider has violin shape on its body, and has six eyes instead of eight like other spiders. Because of its brown color, it can easily hide out in cardboard boxes and inside wooden drawers. Although these spiders are not aggressive, they will bite when pressure is applied, such as when putting on a shirt and a spider hiding inside it rubs up against the skin. When bitten, a slight burning sensation will occur followed by redness of the skin and intense pain within eight hours, along with a large blister. According to Healthline.com, "The venom causes a violet discoloration and breakdown of the surrounding tissue, leading to an open ulcer." Note: Seek immediate medical attention if you believe you have been bitten a brown recluse spider. The venom works fast and will lead to further to tissue damage and possibly death. Some people have severe allergies to certain bugs. In such cases, the affected areas can actually grow as big as two inches in size. But bites can also become infected. If a bite begins to grow warm to the touch, it may be infected and need to be treated with an antibiotic like doxycycline. If you feel that you may be having an allergic reaction or that a bite has become infected, regardless the type of bite, seek medical care right away. 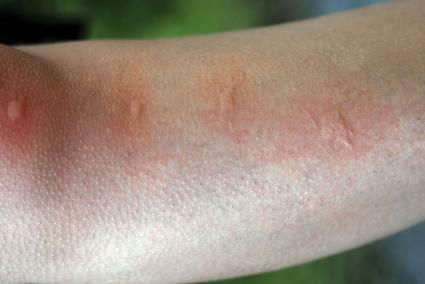 Although most bug bites and stings are harmless and heal on their own, some people can experience anaphylaxis. This severe allergic reaction can be life threatening and people who know they have these types of allergies should always keep an epinephrine pen (EpiPen) near to help with complications. An EpiPen can be obtained with a prescription from a doctor, after it has been decided that the patient is at risk for anaphylaxis. For a person prone to experiencing severe allergic reactions, the EpiPen can help save their lives, but should not be used in the place of professional medical attention. Many times anaphylaxis can strike those who didn't know they were allergic to bug or insect bites. This situation can be very scary for the person affected, but they should try and remain calm. When this happens, the key things to look out for are trouble breathing, and an itchy or sore throat, and swelling of the face or lips. Call 911 immediately. If the throat permits, take a dose of liquid antihistamines such as Benadryl, to help with the symptoms until medical help arrives. Bites from black widow and brown recluse spiders should be treated with medical attention quickly. Also if one is allergic to, or has been bitten or stung multiple times by bees or fire ants, they should seek medical attention immediately. For less severe bites that have not healed within a week, and irritation still persists, you may also want to seek medical attention to make sure an infection has not occurred.